Potosí had captured my attention before I began planning the trip through the north of Chile, Bolivia, and into Peru — but I had never heard of the city before I moved to Chile. 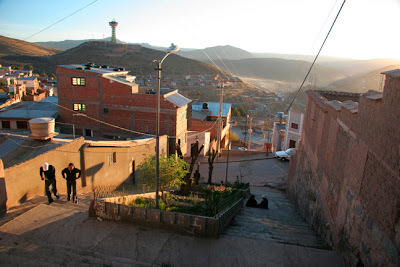 Then I began to hear stories of the mines in Cerro Rico from an Italian photographer friend. A Chilean executive businessman described to me the influence of Bolivian mined silver on the European economy of the 16th to 18th centuries. Because of my interest in the mining industry and the intriguing historical accounts of this towering city, I felt compelled to visit. The bus ride from Uyuni to Potosí is ordinarily about six hours long. My friend Lena and I decided to make this journey during the day, as we weren´t sure about the quality of roads and buses. It was June of 2007, and an incredible heat saturated the air that fell in direct sunlight; a remarkable difference in temperature waited in every angled shadow, and at night, especially in buildings without heat, the Andean chill proved most persistent. My seat on the bus collected full sun, and a decision had to be made between opening the window and filling the bus with dusty air from the arid countryside or dealing with the crowded heat. Unfortunately I had to use the restroom so badly (a result of the scarcity of bathrooms) that the decision seemed too trite to deal with, and I simply did whatever the Bolivian in front of me chose to do. I believe that was the first time in my life that I rejoiced at the announcement of a flat tire, something that seemed to be taken in stride as a rather common event for our fellow passengers. We filed out of the bus, many of us looking for an obliging rock on which to lean. An abandoned house made of mud or clay bricks sat on the banks of a trickling river, and many passengers wandered down to take a drink. A flock of sheep bleated at us as they wandered by, monitored by a woman in a gathered skirt and a cap. A team of passengers assisted the driver with the tire and we continued. Lena and I befriended an Argentinian traveling through some of our same cities, and, in need of a hostel, he followed us to ours. The trek might not have been so arduous had we not been with our heavy clothing in the mid-afternoon sun, packed with our backpacks and walking up steep hills in a city of 4,090 meters above sea level—about 13,419 feet. Potosí is much larger and condensed than Uyuni: Germán, our guide from the 4x4 tour, had told us that about 7-8,000 people live in Uyuni, and current population estimates for Potosí are about 125,000. We dropped off our backpacks and several layers of clothes, and began walking the streets. While we spent a good deal of time wandering — buying fresh juice from stands in the street, oranges from the central market, submarinos from a little café, flat breads from sidewalk vendors (and unfortunately for my stomach, some street cheese) — a top priority for me was to visit the infamous mines that weave through the mountain looking over the city. Cerro Rico literally means “Rich Hill,” but it has a much more complicated significance to regional and world history. It is said that the Spanish gave the mountain this name once they discovered the astounding silver deposits it guarded, but the local indigenous people had already known about the mountain’s content. The root of the name Potosí is still debated by some, as it could have roots in Quechua or Aymaran, the two most prominent indigenous languages of the central Andes area. The next morning Lena and I rose early and headed toward La Casa Nacional de Moneda, where a large painted mask smiles effusively (and a bit unnervingly) over the courtyard just inside the entryway of the old expansive building. This building is the second mint constructed in Potosí, by order of the Spanish crown. The original mint lasted 192 years, from 1575 to 1767, during the peak of silver extraction from Cerro Rico. The coins created during this period were circulated throughout the world and at one point symbolized riqueza, poder y gloria – wealth, power and glory. Records say that 45,000 tons of silver were extracted from the mines at Potosí from 1556 to 1783. The silver was shipped to Spain, but most of it didn’t stay there. The surge in wealth helped the king pay off large debts. New connections between continents and countries forged and the silver taken from Potosí and other Latin American locations flowed through trade routes and across borders. The European economy saw dramatic changes in the definition of wealth, and inflation spiked. The value of silver plummeted to a dramatic low, and Europeans began to desire — and buy — luxuries which they imported from around the globe. Slave trade also increased, and Africans were shipped to work in the mines as well. The altitude proved fatal, however, and the local indigenous were forced to work the belly of the mountain for Spain. Many sources estimate that 8 million miners died during the most productive years of the mines at Potosí, but our tour guide encouraged us to remember that the number is most likely much higher. After choosing our tour guide company, of which there are several, Lena and I suited up in plastic orange outfits, attached our lamps onto our hardhats, and drove with our guide up to the Miner’s Market, El Mercado de los Mineros. Here we purchased 2 liter bottles of orange or cola flavored pop and large bags of coca leaves for the miners we would encounter while walking through the shafts underground. We drove high up one side of the mountain to a mine entrance that still had blood spattered above it: about a week ago there had been the annual sacrifice of a llama, asking for the safety and productivity of the miners. Shortly after entering the opaque darkness of the mine, we met with whom is now called Tío, one of the statues representing the god of the world underground for the miners who work in it. Every day they begin with a ceremony to Tío, a name the Spanish mistakenly took for their word “uncle.” We were told that it comes from a word in Quechua for god, because although the Spanish said that it was the devil, for the indigenous it was not so negative. Our guide told us that just as there is a god for the world above ground who protects and guides people, there is a god for the world underground; in following, the miners ask for protection and prosperity every day. Unfortunately, even though the mine is now a collective, and miners can keep their earnings for themselves, it is terribly risky and difficult work. Shafts that have been closed for decades will be discovered, and the desperate will weave their way through dangerous tunnels looking for minerals. The hope for striking it big drives many impoverished into the mines, including children. Many live in makeshift dwellings around the mountainside, hoping for a better turnout. Illness and disease often follow the years spent inside the mine, after exposure to toxic materials. Although we met many who have said they have benefited from working in the mine, it is not questionable that what they have endured inside it has not been humane. Walking out into the sunlight at the end of the mineshaft surprised me with its starkness. Exhausted from a few hours of crawling and bending and climbing, I wondered how the miners subsist an entire day on the large wad of coca leaves packed in their cheeks, even if it does mask their hunger. We stumbled back to our hostel, took showers during the hours that the water heater could be used, and spent the rest of the day meandering, chewing on our tourist view of one of the most infamous mines of the new world. Zequi had decided to extend his stay in Potosí and explore a nearby town and some hot springs in the mountains, daytrips that are advertised in pamphlets at the hostels and tour guide offices; Lena and I decided to stop next in Sucre, slipping the city into our agenda last minute. We met for dinner the night before we left, and toasted to the crossing of paths in the highest city in the world. 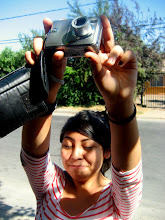 See photos from Potosí here.